FINALLY – after 19 years of faffing around – MOLLYMAWK IS IN TIERRA DEL FUEGO! Wa-hoooooo…! Trrraaa… (and other strange exclamations). Well, this event certainly deserves a trumpet fanfare! 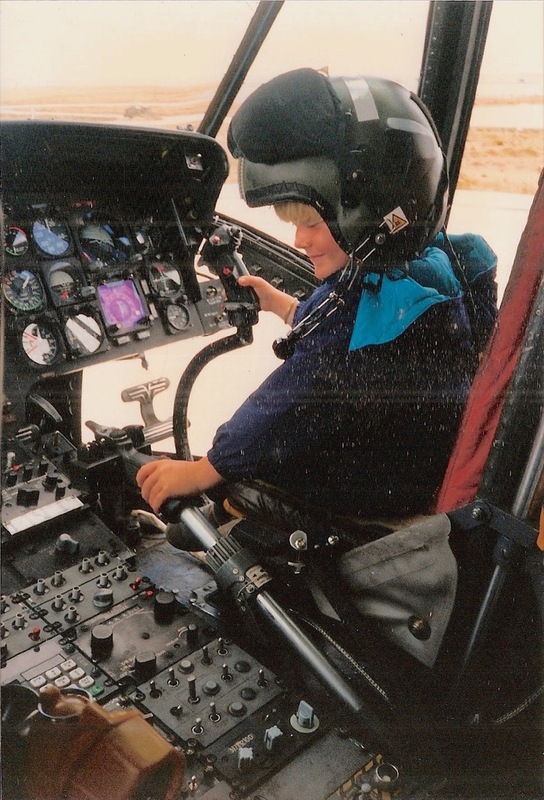 Caesar at the controls of the chopper which rescued us after our capsize 19 years ago. Can it really be 19 years ago that we got caught out in that hurricane-force storm and rolled the boat? What a day that was…! And how far-reaching were its effects! There we were – pootling across from Argentina to the Falklands, with every hope of spending Caesar’s fifth birthday in the Straits of Magellan – and then – BAM!!! – over we went, beneath the mighty crest of a mountainous wave. Away went the masts and the hatches, and in came the sea. 19 years….! 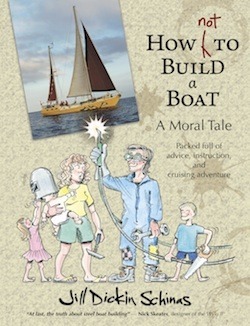 Who could ever have imagined that it would take us all that time to build a new boat and get our act together? Mind you, most of the years have been good ones, and the most recent, spent idling about in South America, have been superb. But, as our friends and regular readers will have gathered, we like sunshine and warm seas – so what, in goodness’ name, are we thinking of, heading south to “the uttermost part of the Earth”? And IN WINTER, for heaven’s sake! 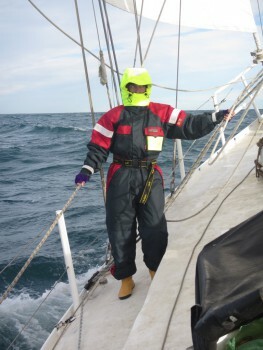 Well, as you’ll see when you scroll down and look at the photos, there are certain compensations for having to dress like the Michelin man and still endure cold feet and frozen fingers. During the past few weeks we’ve been privileged to explore some of the most remote and unspoilt scenery in the world, and we’ve also enjoyed some close encounters with the resident wildlife. 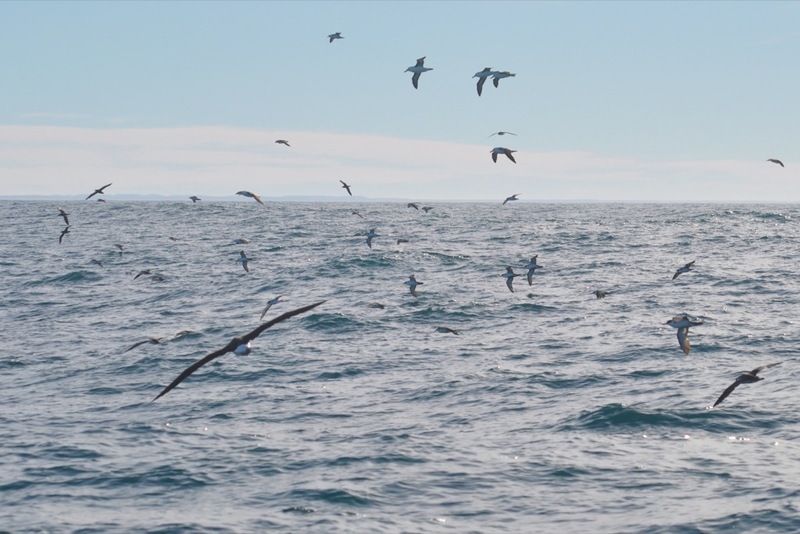 We’ve become accustomed to the fact that one sees far more sealife in the less-polluted, less over-fished southern hemisphere than in the north, but we’ve never before seen so many birds as we did on this trip from Puerto Deseado to Staten Island. Throughout much of the journey they were wheeling around us in a mixed flock of several hundred! The most abundant bird was the great shearwater – which happens to be the author’s favourite – but there were also scores of black-browed albatrosses, otherwise known as mollymawks. Yes, this is our gallant vessel’s namesake! Perhaps they recognise their likeness in the image painted on our transom. The two in the middle of this photo are sub-adults, with a black tip to their yellow beak. 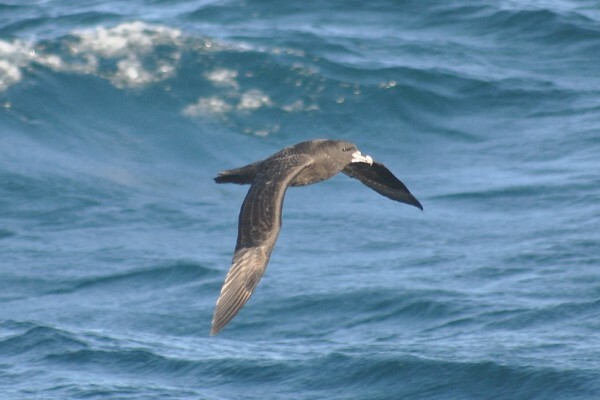 Other birds seen on this trip include tiny Wilson’s storm petrels, which flutter about like butterflies, and giant petrels, which are as big as a mollymawk but rather ungainly in appearance. The old sailors knew these ones as “stinkers”! 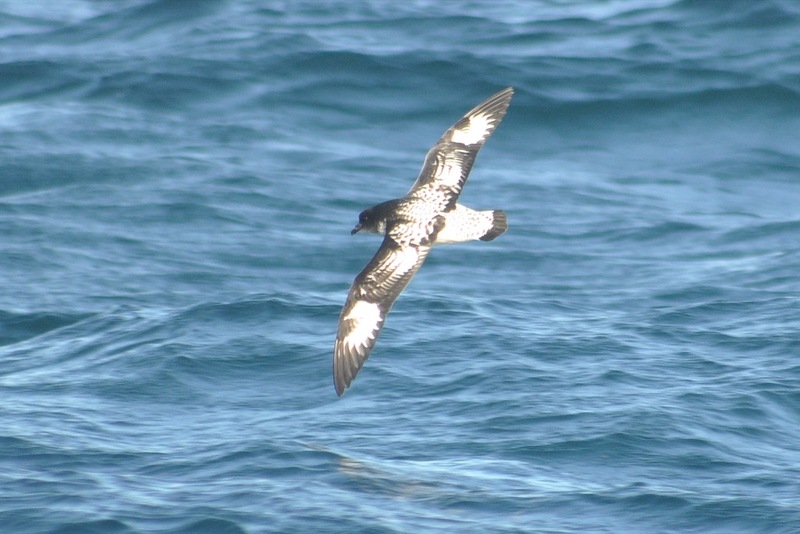 There were also quite a number of white-chinned petrels flowing along with the rest of the crowd. These birds are chocolate coloured and seldom have the white chin which is supposed to be their distinguishing feature… so we call them chocolate petrels, or “choccies”. 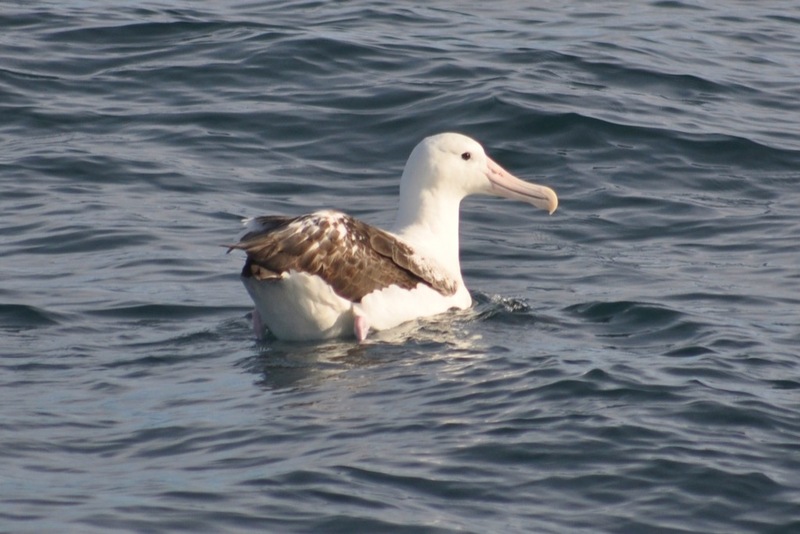 If you enlarge the photo and zoom in on it you’ll be able to see the complicated form of his beak, which is especially designed to cope with a diet of salt water. Why the petrels should need this while none of the others do is a question which no one has managed to answer – so far as I am aware. 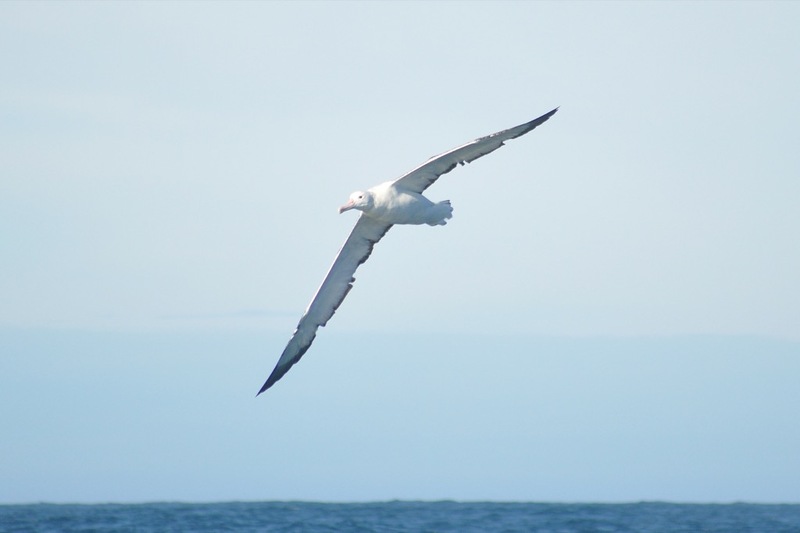 During this trip we also saw our first Antarctic fulmars – very beautiful and gentle-seeming birds which, as you can see, are reminiscent of doves – and we glimpsed Magellanic penguins and rockhopper penguins bobbing about in a half-sunken state in the waves. We saw a few prions, flying around in a cloud, like gnats; and we saw a large number of diving petrels, the latter being another “first” in our book. These tiny little birds (no bigger than a swallow) can fly, but running seems to be their preferred means of getting away from the big bad boat as she bears down upon them. If forced to take to the air they fly very low, and rather than skim over the waves as the other birds do, they just keep right on. Without the least hesitation, they fly straight through the water! 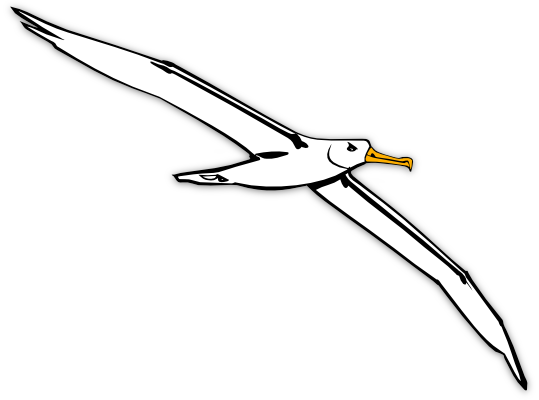 … and, of course, no visit to the Southern Ocean is complete without the sighting of the greatest seabird of all: the wandering albatross. It’s hard to get the scale of things when they’re sitting on a plain blue background, but this chap has a body-length greater than a swan, and his wingspan is even more than that of the condor. 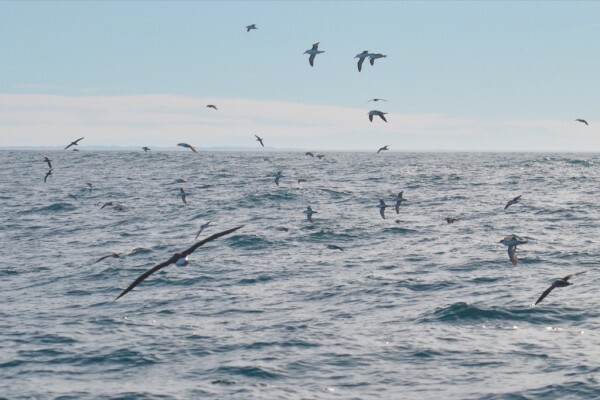 For all that he is a giant, Diomedia exulans mucks in with the rest; he doesn’t try to bully anyone or steal whatever grub they may have found, and even the tiny storm petrels seem content in his company. It’s only when he is sitting with a gaggle of other birds that one begins to appreciate his size. He makes the enormous black-browed mollymawks look like seagulls! One of the highlights of this trip was the sight of two wanderers flying a royal ballet in a stiff breeze, their outstretched wings almost brushing one another as they swung along, soaring and swooping over the waves in perfect unison. 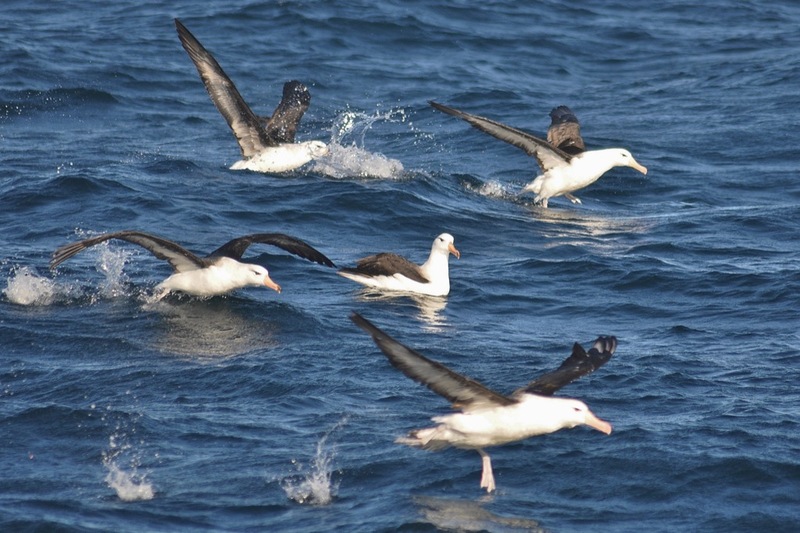 The South Atlantic is also home to far more animal-life than the north. 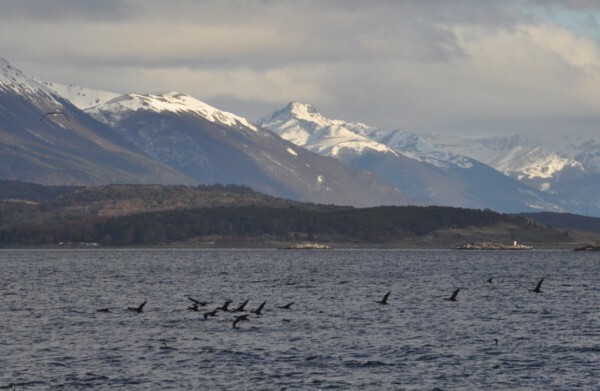 During this voyage we enjoyed the company of Commerson’s dolphins and dusky dolphins – both of which will stay with a vessel for hours on end – and as we neared the tip of the continent we were joined by a troop of about fifty young fur seals. 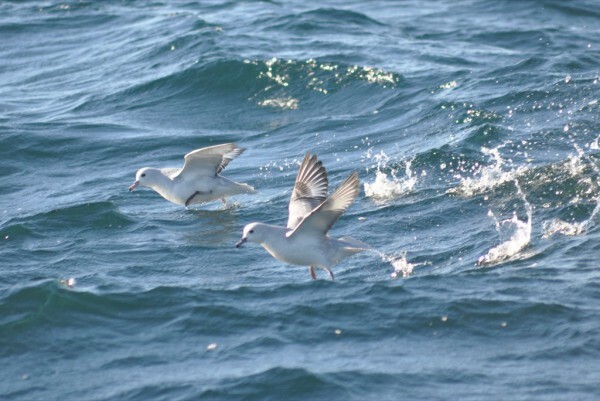 They raced alongside us for almost an hour, hurling their streamlined bodies out of the water as they fought to keep up. 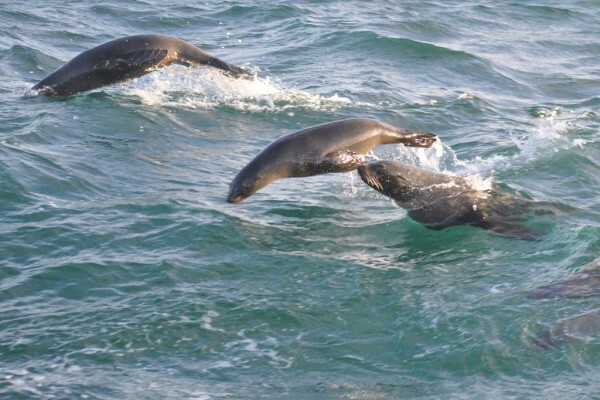 Modern protocols insist that vessels must keep clear of seals and cetaceans in order not to annoy and frighten them – but the animals don’t seem to have read the rules. Anxious not to cause distress to a bunch of Commerson’s which were feeding nearby, we once delayed starting our engine and motoring into our chosen anchorage; however, when we were eventually obliged to hit the button, the dolphins all instantly leapt out of the water and rushed, not away, but towards us! They were positively eager for the company of a boat slicing through the water. Likewise, these young seals sought us out when we were romping along, and they evidently enjoyed the challenge of a hard sprint. It was on the day that the seals rode with us that we also had our first glimpse of Tierra del Fuego, the Land of Fire, and the lodestone which has been pulling at us for all these years. I could hardly believe that we had finally made it! But, of course, we hadn’t – not quite – and we’d just picked up the forecast for a storm-force wind, due to arrive in 48 hours time. And how did we get the forecast? With our brand-new sat phone – that’s how. 19 years ago, our only way of forecasting the weather was to study the sky and watch the barometer. Our new toy makes cruising in these latitudes very much safer. 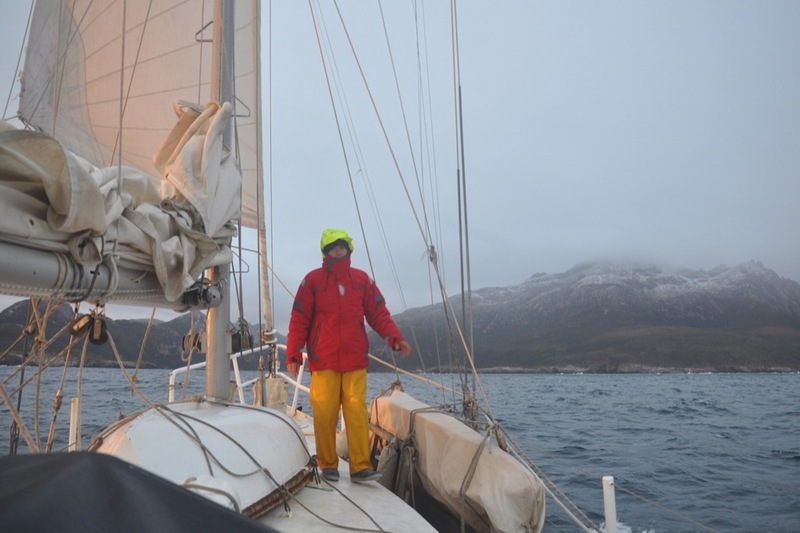 Having read the forecast, and having realised that we couldn’t make Puerto Williams before the storm hit, we altered course and headed for the nearest safe haven – which was Staten island. We arrived during the hours of darkness, and at dawn the following day the sun, glancing briefly twixt the horizon and the louring cloud, revealed a rugged isle whose mountaintops were dusted with snow. … but the rewards were fantastic. We felt as if we were moored in a lofty Alpine lake! It wasn’t really the weather for using the privvy… but the wind left us untouched; while the clouds hurtled past and the snow was torn from the tree-tops, our corner of the lake remained as unruffled as the tea in your cup. 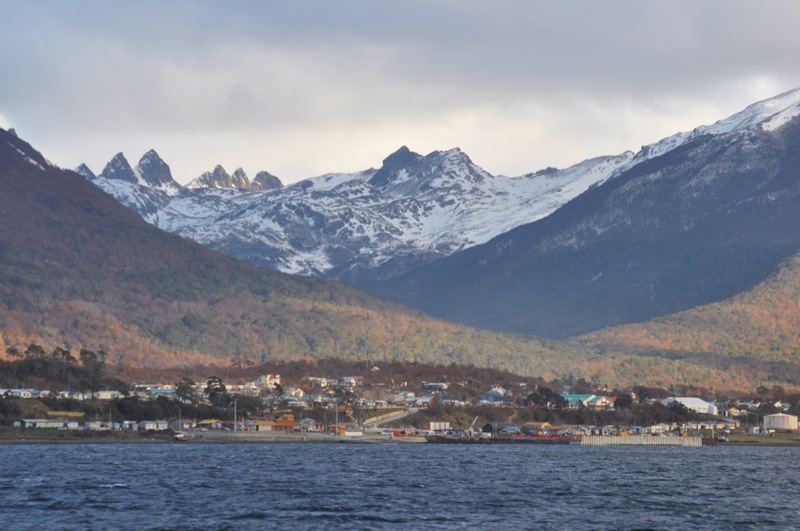 …and Chile to port. Over the years we have often built pictures of this place in our imaginings, but the pictures were wrong. 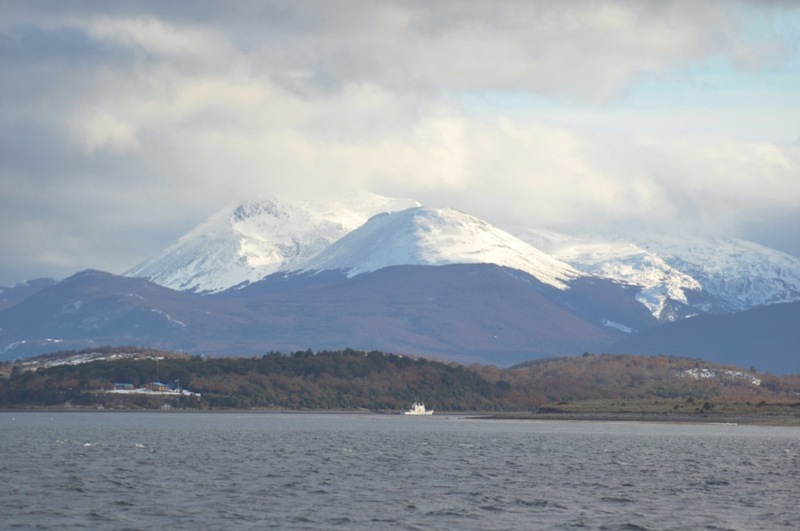 We had imagined grey mountains, purple clouds, and heavy rain; yet here we were, bowling along on a force five beneath sun-lit, snow-capped peaks. Once described as “the uttermost part of the Earth”, it seems like a good place to hang out for a little while. Watch this space, and we’ll tell you more about it over the forthcoming weeks. Yes, that was the only way into that inner harbour… the gap the other side of the rock does look a little wider but not much, and it involves putting a wiggle in your course just at the crucial moment as you pass through. 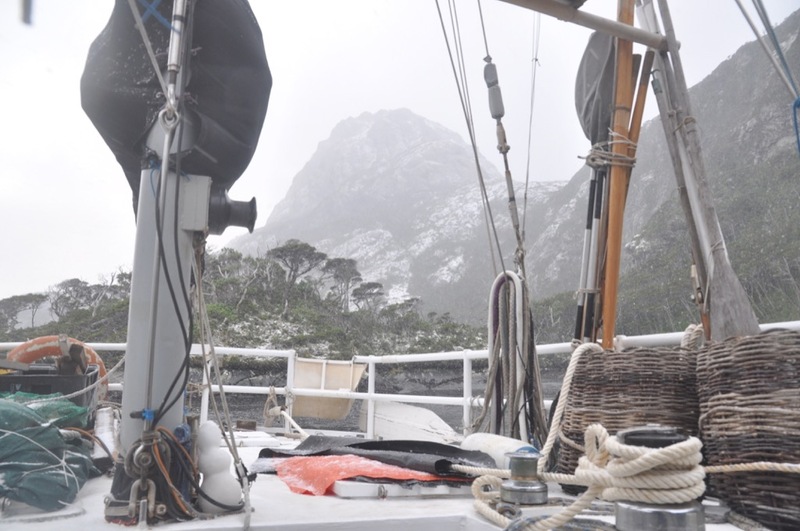 Everyone who has been there recommended the track to starboard of the rock, and we didn’t feel like being the first to go the other side… but we did actually go back in the dinghy and take soundings and there seems to be sufficient depth both sides. I wouldn’t want to try it with 7.6m beam, but at high tide I guess you would probably be okay as the gap would be wider. Of course just because you visit the area doesn’t mean you have to visit that harbour! 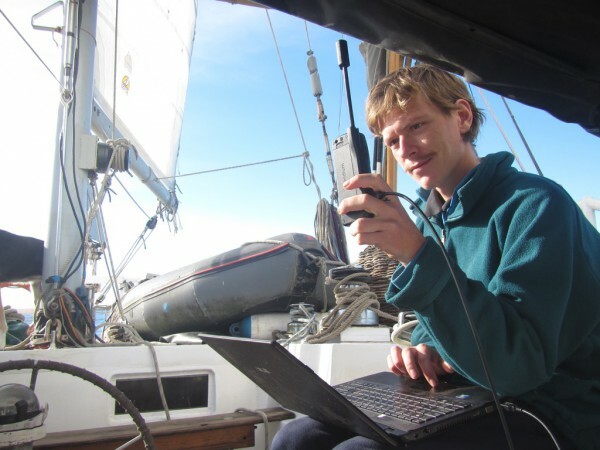 Hi guys, really enjoy the article, may I sugest you do one specifically abou the new sat phone? How you use it as a tool to navigate, prices, recommendations. Best regards. Rafael. Good idea, Rafael. Will do. Congrats and well done! 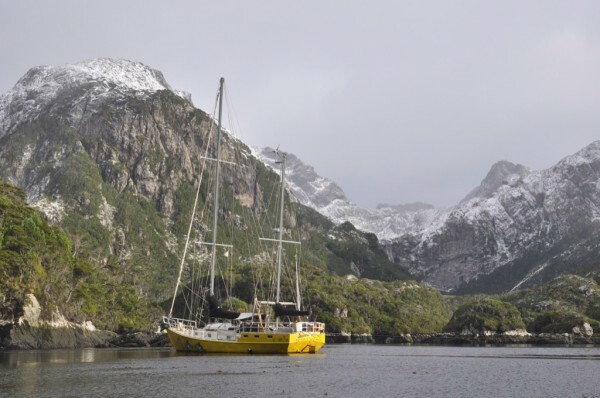 After reading all your books, and following your journey, I believe you have earned your Tierra Del Fuego time. Enjoy! I just told Judith McKone your whereabouts. beautifull place to judge by the pictures!